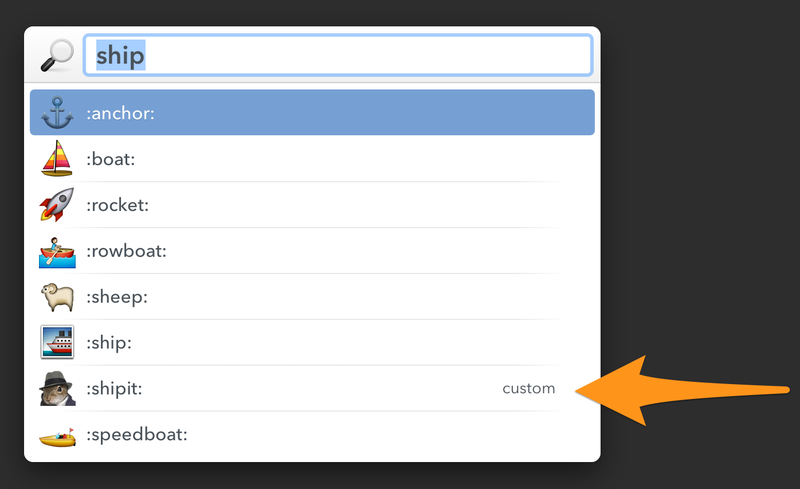 Emoji Lookup is an action for finding the perfect emoji by name or keyword. What about Launchbar's built-in emoji action? Launchbar's built-in emoji action is great when you already know the name of the emoji you're looking for. Sometimes though, you don't know the exact name, but you do know a keyword or synonym. With this action, whether you know the exact name or you only know a keyword, you can quickly track down the emoji you want. Last edited by jasonrudolph on Sat Dec 01, 2018 6:02 pm, edited 8 times in total. Great action! Thanks! Having it updated with support for the new emojis would be great. veke71 wrote: Great action! Thanks! veke71 wrote: Having it updated with support for the new emojis would be great. I agree. That's definitely something I'd like to do. Emoji Lookup v0.4.0 is now available. I've updated the original post to reflect the v0.4.0 release. Enjoy! Would it be possible to somehow show what emojis are NOT supported? The new ones seem to come up in the search, but when inserted the do not show. Could be good to know beforehand. Thanks again! veke71 wrote: Would it be possible to somehow show what emojis are NOT supported? The new ones seem to come up in the search, but when inserted the do not show. What version of the action are you using? What application has focus prior to you triggering Launchbar? When you enter that text, what emoji do you see in the result list? You said, "when inserted they do not show." Which emoji are you trying to insert? When I go and find an emoji from the new ones (in 10.11.1) (let's say "the middle finger") in the Emoji Lookup action, it will insert :fu: instead of the emoji. I don't know which ones are the new ones and if would be good to know when I've looked them up if they are one of the ones that are not supported or not. Was that understandable? All the older ones works great! veke71 wrote: When I go and find an emoji from the new ones (in 10.11.1) (let's say "the middle finger") in the Emoji Lookup action, it will insert :fu: instead of the emoji. Thanks for the clarification. The Emoji Lookup action includes a few custom emojis that are supported by services like GitHub and Basecamp. ":fu:" is one of those custom emojis. When you choose a custom emoji, the action inserts the tag (e.g., ":fu:") for that emoji instead of inserting a unicode emoji character. I've published v0.5.0, which includes this enhancement. I hope this helps. Emoji Lookup v0.6.0 is now available. I've updated the original post to reflect the v0.6.0 release. Enjoy! Emoji Lookup v0.6.1 is now available. I've updated the original post to reflect the v0.6.1 release. Enjoy! But it doesn't seem to be active. Is there some trigger other than typing the word 'emoji'? I also tried typing some of the keywords from the emojilib/emojis.json file and ones which are unique there don't seem to trigger anything either. Is there some other activation or configuration step? This is my first time installing an LB action. JoeGermuska wrote: I've installed the Emoji Lookup launchbar action. I can see it in the Launchbar Action Editor, and in the right place in ~/Library/Application Support... But it doesn't seem to be active. 1. What version of LaunchBar do you have? 3. When you view the LaunchBar index, can you confirm that the action exists and is enabled? 4. What text are you typing in LaunchBar when you attempt to trigger this action? 5. Can you try installing another custom action? If that works, it would tell us that the issue is specific to this particular action. jasonrudolph wrote: 3. When you view the LaunchBar index, can you confirm that the action exists and is enabled? This seems to be the rub. I didn't realize that I had to enable all actions (or, maybe, I didn't realize that I had disabled them).